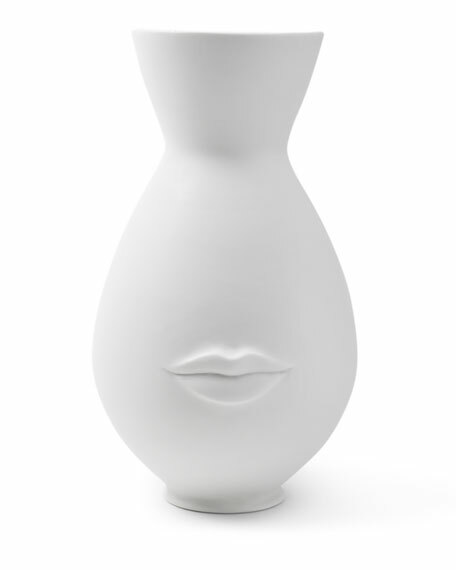 Vase with full lips on one side, mustache on reverse. High-fired porcelain vase features dragon design. May be used both indoor or outdoor. Made in Jingdezhen City? ?the capital of porcelain in the world has 2,000 years of porcelain production history. 12"Dia. x 21"T. Imported. Urkiola tall vase. Designed by Spanish architect Patricia Urquiola. 4"Dia. x 12"T. Mirror-polished and ribbed stainless steel. Hand wash.
Handcrafted small Angelic bottle. Inspired by icons of mid-century modern design. 3.75"Dia. x 15"T. Blown glass. Made in the USA. High-fired porcelain maze vase from the Versailles collection. Approx. 7.75"H x 6.6"W x 4"D. Golden accents. Footed base. Hand wash.